Mary is little darling's good friend, whom I have known three years ago. We never failed to visit her family during the Deepavali's celebration. The last visit to her home, I could sense she was much a happier lady. I told her, she is a A Happy Woman today comparing the last two years. She was curious to know how I could see her mind. My explanation... A laugh can determine whether a person is truly happy or not! 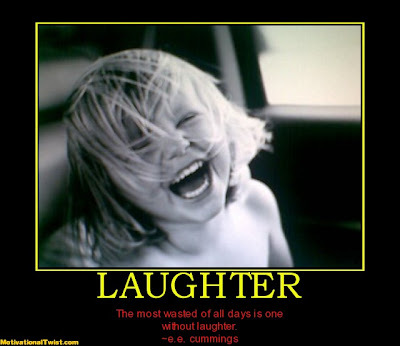 A flick laugh is usually from the mind. It's just a gesture to acknowledge another person. Or to pretend that you are happy. This hypocritical laughter doesn't come with a sincere smile and the voice is flat and doesn't sound cheerful. The flick laugh comes like "Haha Haha!!!" On the other hand, a truly happy laugh is one that vibrates and translates from the heart. It is more sweeter and tastier. This laughter could not be controlled because it's a natural sounding from the mind and the heart. The facial shows the expression of joyfulness, the pitch of the voice is relatively high and the movement of the body is graceful and charming. The laughter goes like "Hahahaha Hahahaaaaa!!!!!!!" Yes! My dear sister Mary, I'm so glad you finally found your love and happiness. Remember this quote... "A happy heart would see a beautiful world." Those who appreciate laughter are cheerful people. You are one of them my dear. Just a gesture from the heart will not make any difference. Spoken by mouth and not felt in the heart. You gave a good explanation. Thank you Robert. Have a nice day! I could also feel the sincerity in your comment. Nice to have known you now my dear.